100% Pure Certified Organic*. USDA Organic. 100% Pure & Natural. Behold the jewels of pressed South African rose hips and discoveryounger, firmer looking skin. Beneficial toall skin typesincludingacne-proneandoilyskin. Ideal formature, aging skin. Rediscover a forgotten beauty secret coveted by ancient civilizations. Extracted from hips of the sweet Briar Rose, its high concentration of anti-oxidants reverses damage due to sun and environmental factors. Its high concentration of vitamin A, omegas and lycopene heals and regenerates skin as it encourages healthy cell growth and dramatically reduces scarring. Daily application produces soft, plumper looking skin. 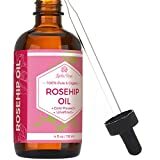 Contains only:100% pure BCS Oko certified organic rose hips seed oil (rosa rubiginosa) The Aroma of this product is due to its unprocessed, unrefined nature, and therefore is natural. How to use: Face & Body: Gently massage drops of South African Rose Hips Oil into skin. Use Daily. Scarring: Apply to scar twice daily. If rash or irritation occurs, discountinue use.